I felt determined to open myself up to the perspectives of people whom I felt invisible boundaries with, in spite of shared interests, classes, and passions. Hannah’s group of Fact Finders arriving at Ben-Gurion Airport in Tel Aviv. 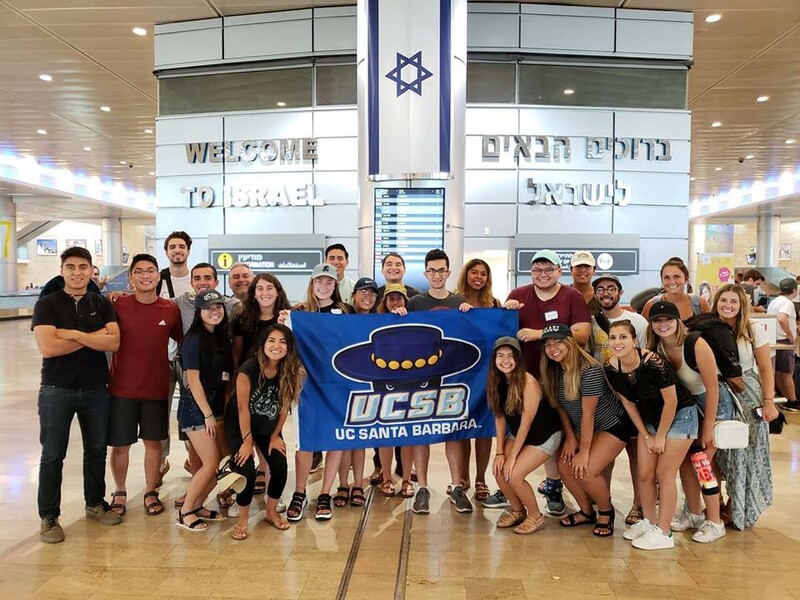 When I arrived at UC Santa Barbara, I found that many of my Reform Jewish peers supported and loved Israel, while I quietly maintained my uneasiness and lack of education on the topic. To me, Israel was a concept that held little relation to my Southern California bubble. It seemed a distant idea that many in my community felt uneasy about. As a result of having little personal connection, I neglected to pursue the topic further and preferred to avoid it altogether. It was not until the BDS resolution once again rolled around my freshman year that I found my Judaism being inextricably and negatively associated with something I knew next to nothing about. I realized something was happening that I could no longer separate myself from, and I needed to engage with and combat the subtle and overt anti-Semitism that arose as a result of the sentiment of the movement on campus. I wanted to understand the contentiousness seemingly inherent to any Israel-related issue and why these issues continue to resonate personally with many Jews. In order to educate my peers about the inherent diversity of Judaism, I needed to educate myself. I began to fight my own ignorance by reading, attending conferences, listening to speakers, and talking to friends. A town called Barta’a that straddles the Green Line, which lies between Israel and the Palestinian Territories. Still, I wanted to gain a greater understanding of the vehement opposition to Israel on campus. Being surrounded on Fact Finders by people with different backgrounds, unique experiences, challenges, and stories forced me to break the stubborn silence. I had never dared to make eye contact with many of these people at student senate battles, however, I pushed myself to leave behind the fear and move forward without hesitation. Persisting through strained small talk, I was scared to ask questions of others, “Have you experienced discrimination on campus?”, but in turn I made space to speak my truth, “I feel that liberal Zionist Jews are excluded from the progressive community on campus, and I think it weakens the progressive cause and community”. I found that people surprised me with their willingness to listen and learn when I was willing to provide the same. By being open to hearing multiple narratives, without sacrificing my own beliefs, I opened up, and that fostered genuine trust and compassion. I watched some of my peers struggle with holding on to their fear, which prevented us at times from being able to listen and understand one another. Still, instead of feeling frustrated with their reticence, I understood that their own experiences with discrimination and bias were valid and that we were all struggling to reconcile others’ truths with our own. I found myself recognizing all the unique factors that have allowed me to live safely in America as a Jew, while also being cognizant of the fact that I still experience micro-aggressions (but also macro-aggressions) that are sometimes minimized in the face of other societal issues. 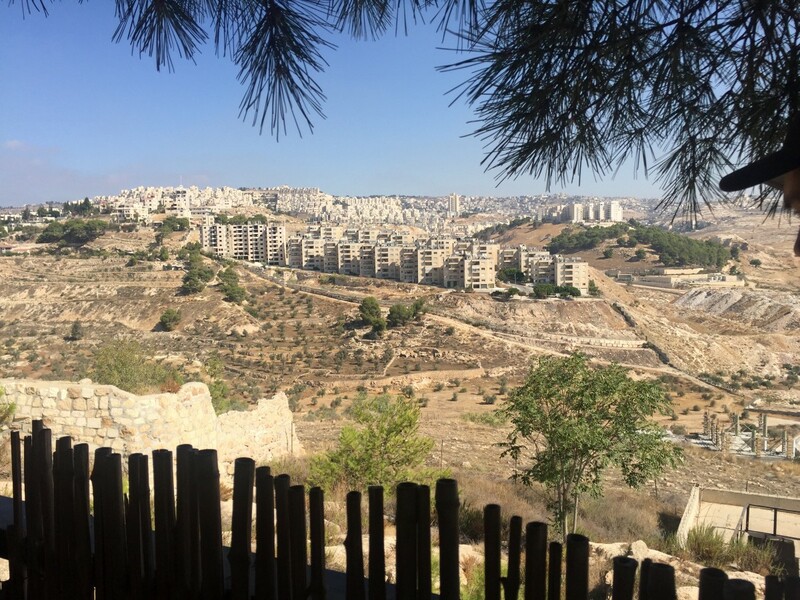 An overlook in Bethlehem into settlements in the West Bank. Two experiences sum up the duality of my trip, reflected in both the sentiment on campus conveyed by my peers, and by the different narratives that we saw and experienced in Israel and the Palestinian Territories. The first one came at a small hummus shop in Jerusalem. We stopped and had a friendly conversation with the Arab-Israeli owner. We were talking to him about the nature of the trip, and upon his understanding that it was a very diverse group of students, he pointed to me with a smile, gestured to my nose, and said “and she’s Jewish, I can tell.” No one seemed to bat an eye. Though this seemed like such a small incident, I tried to figure out why it had bothered me so much. Throughout elementary school, I experienced similar instances of anti-Semitic comments and jokes, mainly pertaining to my nose, but I always pushed it aside and reminded myself not to be so sensitive. This incident continued to bother me though, and after hearing contradictory narrative after narrative, it hit me.It bothered me because I was being profiled and stereotyped, while at the same time being denied as a member of a peoplehood seeking collective safety and protection even after thousands of years of persecution. In the group discussion that night, I shared this experience, and spoke about the diaspora and the diversity of the Jewish population in Israel and worldwide. The second experience occurred when we witnessed extremely Islamophobic rhetoric from a radical Israeli settler in the West Bank. Not only was I more upset, but I was more receptive to the experiences of my Muslim peers and new friends on the trip. Upon seeing the shock, hurt, and disbelief of my friends on the trip, I saw how anger and prejudice within the Middle East mirrored our attitudes on campus. It was clear that the hurtful and false rhetoric spewed by the speakers impacted others in the same way it did me. I understood when they reacted with anger and fear. By reaching out, asking questions, admitting my doubts, expressing my vulnerability, and simply being willing to listen, I started to bridge a gap. 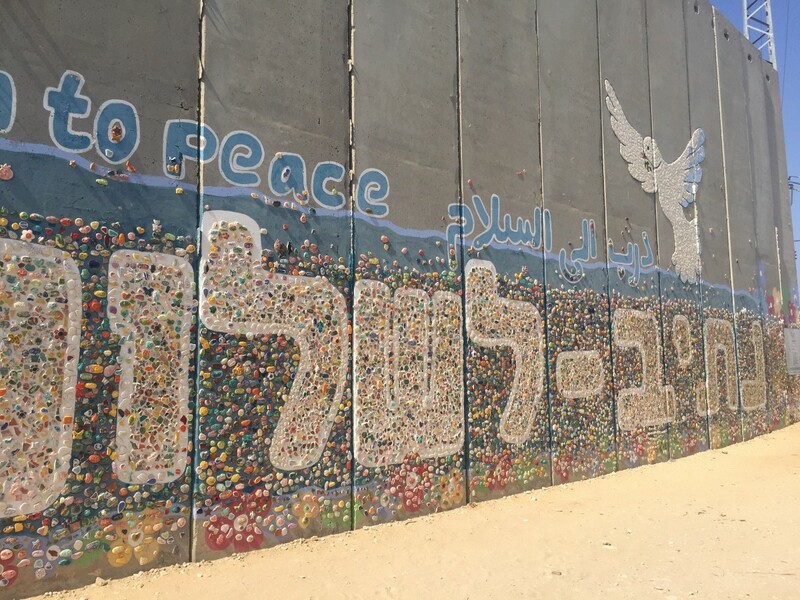 A peace mural in Sderot, a city near the Gaza border, started by a resident and added to by those who visit the city. To reach across the room means to lend a receptive ear to others’ words, and I’ve learned that I cannot let fear of being ignored prevent me from hearing others. Others will stand up for me, but sometimes I have to stand up first. Heading back to school, I realize that there is no truly neutral space for discussions like these — discussions that promote understanding and dissolve the basis for anger born of ignorance. A space like TableTalk would be invaluable on my campus because of the open dialogue it fosters. I envision something like TableTalk on my campus as a forum for people to voice their concerns, thoughts, observations- big and small- and to communicate rather than talking right past one another. When we engage in dialogue, we facilitate understanding, patience, and kindness, even though it can be a struggle. A famous rabbi once said, “The whole world is a narrow bridge, and the most important part is not to be afraid.” Over the course of my trip, the bridge became a lot less narrow, and I became a lot less afraid. 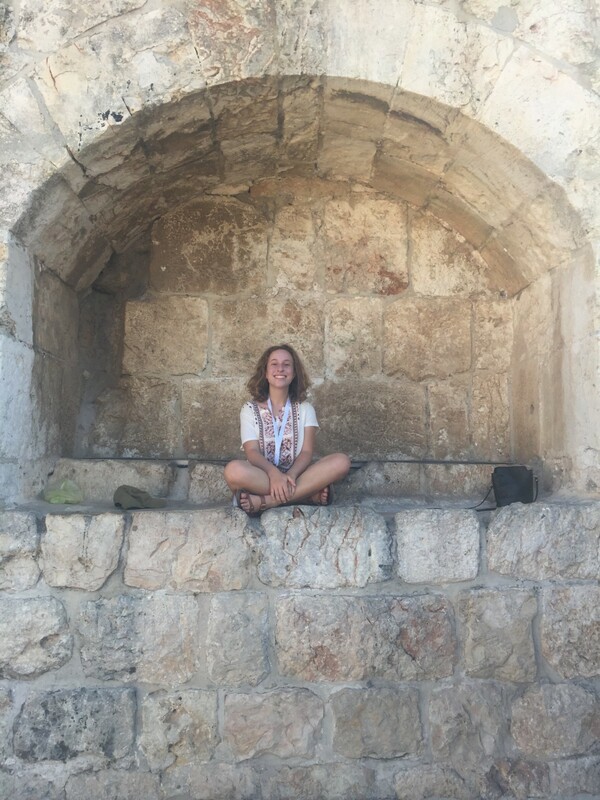 Hannah on one of her first days in Israel, in a nook on top of the ancient walls surrounding the ancient city of Jerusalem.